However I did manage to visit 3 different shops, all with different methods of conducting a sale. One shop had everything in cardboard boxes inside glass cabinets, so unless you knew exactly what model number you were looking for, you didn't stand much chance (since even the descriptions were Japanese). Another shop was like a treasure trove with lots of secondhand items for sale and all freely browsable. I ended up buying some second hand carriages that I've had no luck tracking down online for any kind of reasonable price, and here they were for $10 each; fantastic! It was soon time to head off for Osaka. I went down to Tokyo station and watched the crew getting ready. I'm not great at recognising the different types of Shinkansen, however there were plenty of fast looking trains here today. I boarded and soon we were on our way. I'm slowly coming to the realisation that while they look amazing, because they're so fast and quiet inside, and ride so smoothly, it is very difficult to stay awake while riding them! A lot of the time the only reminder you would get is when they entered a tunnel and the sudden difference in air pressure would cause the train to buck a bit. Ditto when another Shinkansen would pass, the sudden wall of air would cause the train to rock a bit. 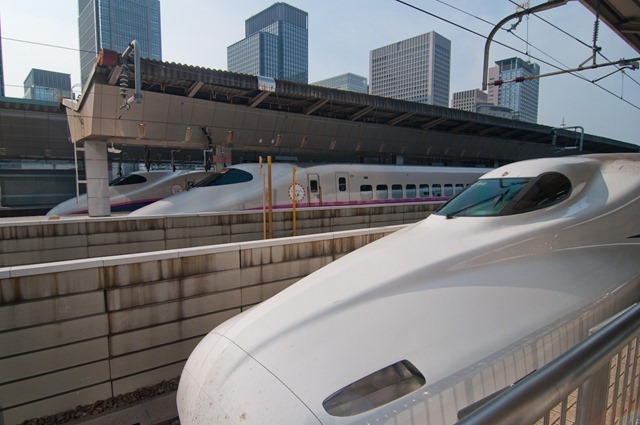 Traffic on the Shinkansen line south of Tokyo is amazing. 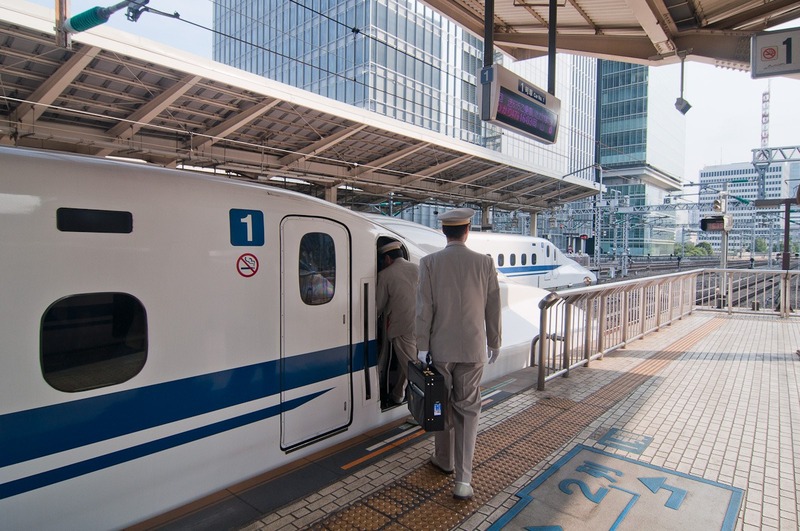 At every station stop we would pause for 5-10 minutes, and during that time two Shinkansen would overtake us, and another two would cross going the opposite way, and often a fifth Shinkansen was pulling into the station going the other way. So that is five bullet trains in maybe ten minutes! The density on this line is amazing. Eventually we arrived in Osaka and I went on a hunt for my previously-booked hotel. For some unknown reason they did not give me a map or directions on how to get there, just GPS coordinates and a street address, and I've already learned how pointless addresses are over here! So I wandered round for half an hour in the searing heat, tring to find their location. Eventually I found it in quite a melly rundown part of town. If they had just said "take the South exit from Shin-Osaka and walk 10 paces"…!!! So I found the hotel and navigated their weird signs to find the reception. Got my room and guess what it smelt really bad! Sigh. I was hungry so went looking for a restaurant. Pickings were slim around this part of town and it took me a good 10 minute walk before I found aything at all. The place I found looked small and friendly and I figured if I could handle an onsen I could handle this just fine. I opened the door and went in and was immediately greeted by the waitress. I sat at one of the single seats that faced the kitchen/counter area. The menu was entirely unintelligible, but there were lots of nice looking kebabs so I ordered a few and a glass of water. The chef and waitress had a quick discussion and she came back with an English menu; initially I was a little disappointed till I realised I'd probably just ordered chicken liver and garlic kebabs! I re-placed my order and the chef jumped into action. While he wasn't tending to my kebabs on his cute little grill, he was busy writing little messages to me on his cellphone, which would then translate themselves into English for me. How fantastic of him! The English was pretty broken to a native speaker, but I was utterly impressed and did my best to answer his messages in my meagre Japanese. It's amazing how much you can say with body language and place names! My first kebabs of chicken breast (in a lovely marinade) and a grilled rice ball arrived and were fantastic and hungrily devoured. I felt a little bad ordering more as it was getting on past 8pm, but more people were arriving and ordering away. One obvious regular arrived and the chef didn't even wait for him to sit down before he started cooking his usual order! The chef meanwhile continued his conversation with me and even gave me a poster of a local Japanese festival here in Osaka; I gathered I had missed it by a couple of days. He also pointed out the carvings and how they matched the artwork on the menus. The waitress meanwhile did a great job looking after me. Eventually I was full and ordered the only desert on the menu; some ice cream (ice cream is "ice cream" in Japanese). The chef immediately apologised that they were out of ice cream and I indicated that was ok, but he dashed off and came back 30 seconds later with some ice blocks! It was a strange shape in a plastic tube, the sort of "make at home" style that I hadn't seen since a kid and I was a bit unsure how to eat it; the chef picked up on this right away and did a fantastic demo of biting and snapping. I can't remember the (entirely Japanese) bill but I'm pretty sure he didn't charge me! Eventually I was ready to leave and wasn't quite sure how to ask for the bill, so I "sumimassen"-ed the waitress and tried to indicate writing a check while saying "bill? yen? how much? money?" — "money" did the trick and there was a flash of recognition and she dashed off. She returned with the bill and typed the amount of yen into the calculator to show me (a common technique over here). I paid happily and thanked her and the chef profusely and as I started getting towards the door I noticed one of the other tables had started to stand up and wave and say good bye; evidently I was a bit of a hit here! I "sayonara"-ed them and some more "arigato goziamas"-ed them and bowed a little and even threw in a "bye bye" with a wave; the "bye bye" got a huge reaction and they all bye byed and grinned and jabbered back! I've noticed that "bye bye" is a very popular English-import over here and I always laugh a bit when I see kids bye-byeing each other. By now I was outside the restaurant and the waitress had come out to see me off; I'd seen her done this with another person so figured it was just what they did her. Can you imagine that in NZ? If the waitress followed you out it would be because she was worried you were going to steal the pot plants at the door! I wandered back to the hotel passing many weird and unpleasant smells along the way; imagine "hot concrete" fragrance mixed with "stale" and "animal waste" (I hope it was only animal waste) and "humid" and leave it all to stew for a few months and that's what a lot of the street corners smelled like here in the quiet part of Osaka! Hotel room wasn't a whole lot better; you can see why I was happy to leave! That said if I ever return here I would happily make a stop at Shin-Osaka and visit the little restaurant that made me feel so amazingly welcome.